Bessie Tsimba remembers farming with her family in Zimbabwe for years. “Back home we used to grow maize and vegetables like onions and carrots,” she says. These days, on her farm in Harvard, Massachusetts, Bessie grows maize and vegetables, including onions and tomatoes. By some measures not much has changed: Bessie continues to raise her vegetables using organic techniques, just as she did in Zimbabwe. But in other ways, everything has changed for Bessie Tsimba. In 1988, Bessie left Africa in search of a new life in America. Like many immigrants, Bessie arrived in America without land that she could farm. So for years Bessie did not farm and cooked meals with vegetables from the store. Over the years Bessie began see farming as a reminder of home and a way to promote healthy eating. In 2009, she seized upon her renewed interest in farming and joined New Entry Sustainable Farming Project's programs. “It's something we grew up doing back home and I benefit from eating organic,” she says. 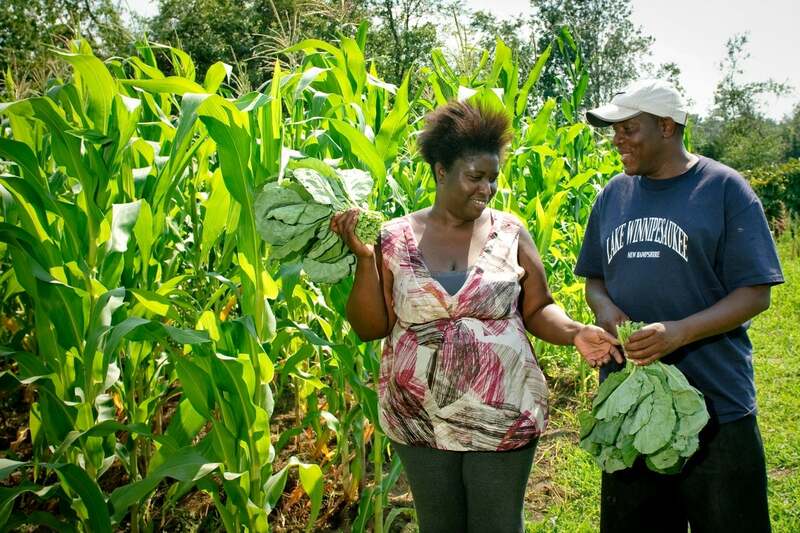 After graduating from the Farm Business Planning Course, Bessie began farming on New Entry's incubator farm sites, selling her vegetables through the World PEAS CSA. This year she enters her sixth season as a World PEAS grower. Over the years, despite a busy off-farm life, Bessie keeps expanding her farm. In 2013 she moved to a new plot of land, a one-acre site in Harvard, after working with New Entry's Farmland Matching Service to identify a suitable piece of land to farm in our densely packed region of Eastern Massachusetts. Bessie credits the Farmland Matching Service with vital support in helping her secure a site with a sufficient water supply and suitable soil. Now that she has been matched with her land, she plans to continue small scale farming for years to come.